WARSAW, Poland -- Ukraine’s leading defense group Ukroboronprom has signed a deal with German producer Deutz AG to acquire engines for the armored personnel carriers (APC) used by the Ukrainian Armed Forces. The BTR Armoured Personnel Carrier can execute missions during the day and at night, in different climate conditions. The new engines will replace Russian gear, which are to be discarded. With the latest contract, Ukroboronprom is aiming to cut spending on new engines and ensure that the equipment used by Ukraine’s military complies with NATO standards, said Artur Heruvimov, the company’s deputy chief executive, as quoted in a statement. The engines will be supplied to the Armed Forces' BTR-4 vehicles. The procurement will allow Ukroboronprom to save about US $25 million and use these funds to develop and produce new weapons and equipment, the statement said. Ukraine has intensified efforts to replace Russian-made military gear with weapons and equipment supplied by NATO member states following Moscow’s annexation of Ukraine’s Crimean peninsula. 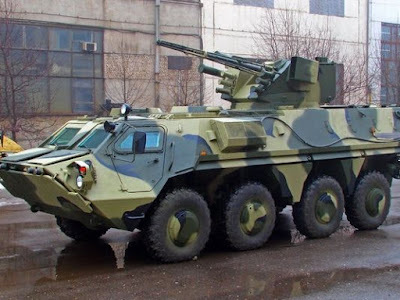 The BTR-4 is an eight-wheel-drive vehicle enabled with a maximum speed of 68 mph, according to data from Ukroboronprom. Based in Ukraine’s capital Kiev, Ukroboronprom is a state-owned group that consists of some 137 companies specializing in manufacturing and export sales of aircraft, missiles, armored vehicles, ships, munitions, radio communication, and other types of arms and military equipment. The group was established in 2010 with the aim to consolidate the country’s fragmented defense industry.